Home Basic Date Questions Questions using library methods How to get all the information about current date in Java? 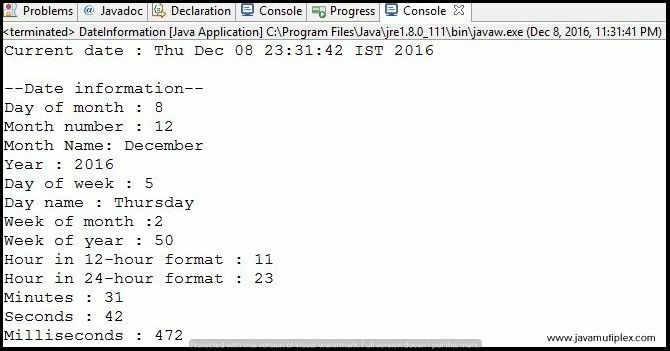 Write a program in that prints following information about current date in Java. We are using following method of Calendar class that is present in java.util. * package. public int get(int field) -> In this method we are passing following Calendar class constants for getting required information. static int DAY_OF_MONTH -> Provides Day of month. static int MONTH -> Provides Month number, for getting month name we are using switch case. static int YEAR -> Provodes Year. static int DAY_OF_WEEK -> Provides Day number of week, for getting day name we are using switch case. static int WEEK_OF_MONTH -> Provides Week number of month. static int WEEK_OF_YEAR -> Provides Week number of year. static int HOUR -> Provides Hour in 12-hour format. static int HOUR_OF_DAY -> Provides Hour in 24-hour format. static int MINUTE -> Provides Minutes. static int SECOND -> Provides Seconds. static int MILLISECOND -> Provides Milliseconds. How to convert Calendar to Date ? How to get month name of given date ? How to get day name of given date ? * @problem How to get all information about current date? Output - How to print every information about current date in Java? How to get all the information about any given date in Java? Solution - This is very simple first of all Convert given Date to Calendar and rest is same as above. 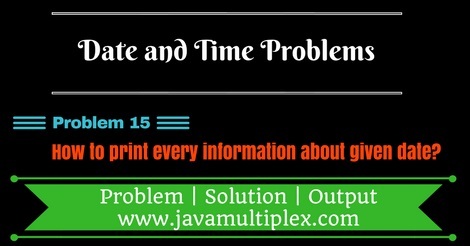 Tags : Date and Time problems, Every information about date in Java, Solution in Java, Calendar, switch statement.